Knitting makes me happy, computers keep me humble. 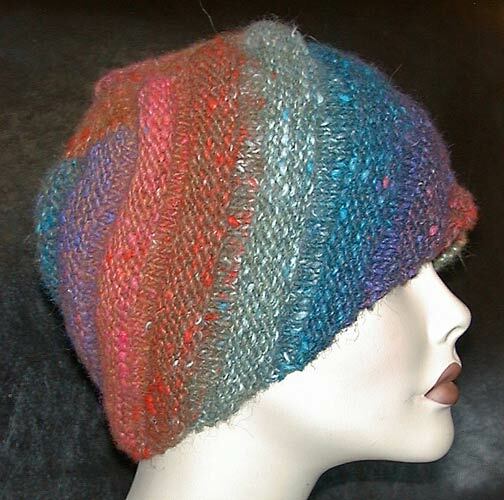 Ann Norling's Swirl Hat pattern done without the lower ribbing - get the pattern at your local yarn store. Shop sample was worked in Silver Thaw from Noro using about 54 grams/ 120 yards. Row 1, 3 and 5 - K1, ssk, knit to one stitch before the end, YO, K1. Row 7, 9, and 11 - Purl 1, purl 2 together, purl to one stitch before the end, YO, purl. When you have done the number of repeats specified in the pattern, attach stitches on the needle to the cast on row by doing a three needle bind off or kitchener stitch. 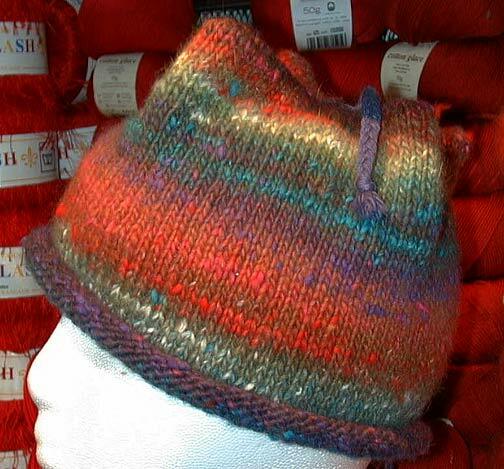 To fill in the top section of the hat, use double pointed needles to pick up stitches all the way around one edge. I was doing the Adult size and I picked up 16 x 4 (64) stitches. Knit one row, twisting all the stitches. Row 1 and all subsequent odd numbered rows - on each needle, ssk, knit to last two stitches on the needle, ssk. Repeat on each needle. 8 stitches decreased. Row 2 and all subsequent even rows - knit around. Continue until you have two stitches on each needle. Kitchner together or do a three needle bind off on the inside.